EN 61069-2 ed. 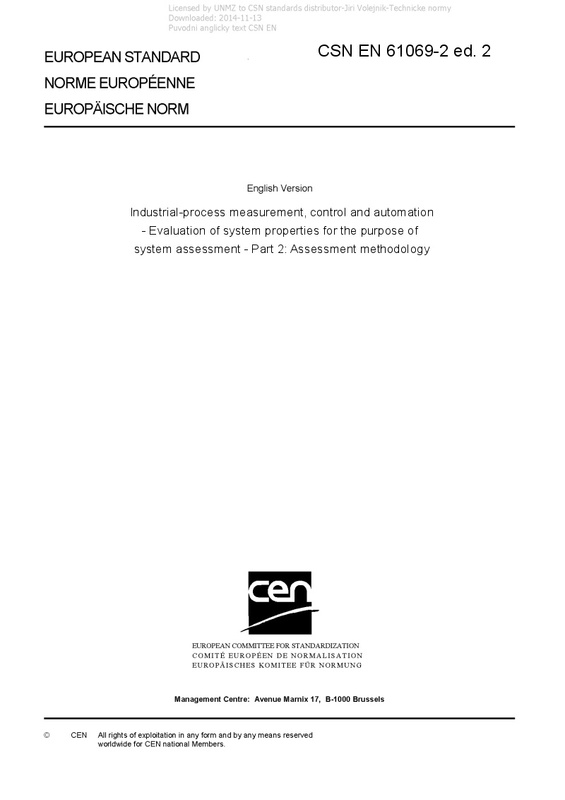 2 Industrial-process measurement, control and automation - Evaluation of system properties for the purpose of system assessment - Part 2: Assessment methodology - IEC 61069-2:2016 specifies the methodology in the assessment of a basic control system (BCS) based on the basic concepts of IEC 61069-1. It describes the method for analysing, weighing the relative importance of the various system properties and influencing factors, and determining an assessment program. This second edition cancels and replaces the first edition published in 1993. This edition constitutes a technical revision. This edition includes the following significant technical changes with respect to the previous edition: - Reorganization of the material of IEC 61069-2:1993 to make the overall set of standards more organized and consistent; - IEC TS 62603-1:2014 has been incorporated into this edition.